Sinclair Community College has been recognized nationally among an elite group of colleges and universities for their leadership in developing programs in interfaith and/or community service by the President's Higher Education Community Service Honor Roll. The application process allowed for the spotlighting of only a few projects however many faculty, students and staff made this recognition possible. In addition to the leadership provided by Service Learning Coordinator David Bodary, the following faculty encouraged community engagement through service learning projects. Next to each name is the number of students they have engaged in service learning. The description and link below provides more detail on this national honor. 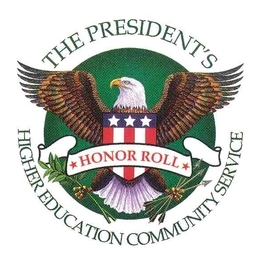 Recognition is available to participating institutions through the President's Higher Education Community Service Honor Roll. At the Fourth Annual President's Interfaith and Community Service Campus Challenge Fall Gathering in September of 2014, the 2014 President's Higher Education Community Service Honor Roll was celebrated in the Interfaith Service Category. There were 98 institutions of higher education honored for their leadership in developing programs in Interfaith/Community Service.